Amazon Queen Pokie Review - Play today! Set yourself free in the Amazon rainforest and run wild with the attractive amazon queen who will lead you through overgrown beauty to the caves of cash. Hidden treasures are yours to take home once you find your way on these tropical reels with the most beautiful graphics. 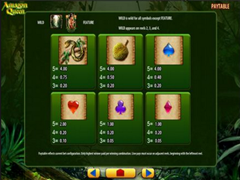 WMS created this pokie on 5 reels with 20 paylines plus selected the best features possible such as wilds, scatters and free spins, to give you the ultimate winning opportunities. The jackpot bonus is set up with a great reward of 2.350 payout with 3 of the other high paying symbols worth 1.200 coin payouts. Affordable betting options makes this a favourite game with the minimum option allowing bets from 0.01 to 3.00 and the maximum bet option allows bets up to 60.00 coins. The graphics is exquisite with true life colour and real illustrations. A sandstone wall offers the perfect setup for the reels with vines and green leafy plants decorating it with green energy. The reels are strips of leather sown together, which gives this pokie an extremely natural feel and look. The symbols are a growling tiger, the parrot with blue and green feathers, black gorilla, amazon wild logo, yellow and black amazon snake, seed ball in yellow colour, spade symbol in shiny blue, jewel of a heart in red, the luckiest clover in purple, diamond in pink and attractive female warrior of the rainforest. This game offers the wild amazon rainforest logo as the wild and once this wild symbols appears on the 2nd, 3rd and 4th reel it will eagerly complete winning combinations and stand in for any of the symbols excluding the amazon queen bonus feature. The amazon queen is the scatter symbol and once she scatters herself anywhere on the reels, great rewards follows. Three amazon queens appearing simultaneously will give 10 free spins, spin 4 of the amazon queens onto the reels and you receive 25 free spins and once you get 5 amazon queens to appear at the same time the ultimate prize of 100 free spins will be yours. 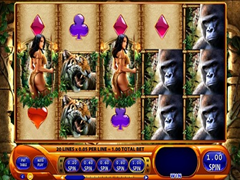 The gorilla symbols offers great payouts once you activates 3 on the line and the best about the gorilla symbol is that payout occur from left to right and from right to left. A wonderful and colourful pokie with great background sounds of the jungle pulling you even deeper into the theme. The bonus features are very rewarding and the free spins offers the player the chance to relax and watch the reels spinning in some great wins without any action required from the player and best of all, no betting are required during the free spins.